Anyone who watches basketball knows that LeBron James has been the driving force behind the Cavaliers’ success this season. But who has been responsible for LeBron’s recent success — aside from, you know, LeBron himself? Not David Blatt, that’s for sure! We can probably also rule out LeBron’s teammates, as he was plenty successful before he started playing with any of them, as well as his fans, who provide moral support but lack the personal connection needed to truly make an impact. Some might point to his family — particularly his mother, Gloria, with whom he famously shares a deep bond — but c’mon: To quote one of LeBron’s most trusted associates, she wasn’t with him shooting in the gym. To find the secret to LeBron’s success, we’ll have to look elsewhere. To his inner circle? His former teammates? The Cavs’ coaching staff? The answer, friends, is all of the above. 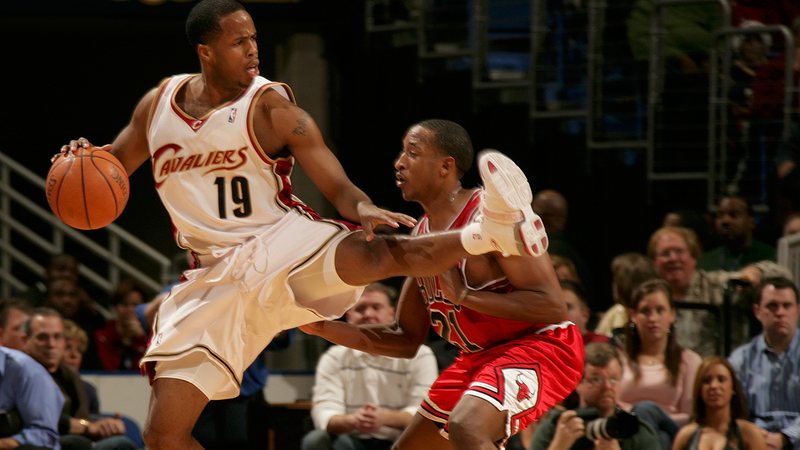 The answer is Damon Jones. Nominally a “shooting consultant” for the Cavs (we’ll remark on this absurdity soon), Jones has been entrusted with following LeBron around for the past year or so, and the results are impossible to argue with. This development would have been difficult to predict 10 years ago, when their relationship began in the most inauspicious way possible: with a devastating posterization. The following offseason, however, Jones signed with the Cavs, paving the way to a friendship with LeBron. To his eternal credit, Jones seized the opportunity, and when he retired from professional hoops in 2012, LeBron naturally came calling. While there were some hiccups along the way, Jones by and large thrived in this role, though his responsibilities were certainly vague — was he LeBron’s Instagram photographer? Did he place food and drink orders? Keep the King updated on current events? Whatever his did, he must have done a good job at it. He earned a promotion of sorts. Jones took on a more public role, which included everything from actually posing in some of LeBron’s Instagram photos (as opposed to just taking them) and acting as James’s unofficial spokesman to the media. All this happened at a time when the public’s interest in LeBron was at its absolute apex, which only added to the mystique surrounding Jones’s nebulous position. While everyone else in the LeBronverse seemed to have a clearly defined job description — Rich Paul was his agent, Maverick Carter handled business and marketing operations, and DJ Steph Floss was his personal DJ — Jones had too many duties to name. They all pretty much boiled down to hanging out with LeBron, though, and the fact that LeBron was spending so much time around Jones during such a crucial juncture seemed significant. It shouldn’t come as a surprise, then, that Jones was able to land a job with the Cavs upon LeBron’s return to Cleveland. Forget about LeBron and Kevin Love — the real package deal was LeBron and Jones, whom the Cavs hired as their “shooting consultant,” which is a ridiculous title for many reasons, namely because it’s completely inaccurate. Case in point: According to Jason Lloyd of the Akron Beacon Journal, Jones is mainly known for “politely informing the media … when availability has ended and the locker room is closed.” In addition, he’s obligated to accompany LeBron wherever he goes, whether it’s to Miami for two weeks of in-season rest and rejuvenation or Dallas to watch Ohio State play in the College Football Playoff National Championship. Nice work if you can get it. Lloyd likewise claims that some folks in the organization wanted Jones to join the coaching staff of the Cavs’ D-League affiliate, the Canton Charge, “but that was quickly squelched.” Well, then. I think we all know who was behind this: LeBron, of course. Secret weapons are not to be shared, and after considering all of the evidence, Jones is undoubtedly LeBron’s secret weapon. Now it’s just a matter of finding out how effective he is.